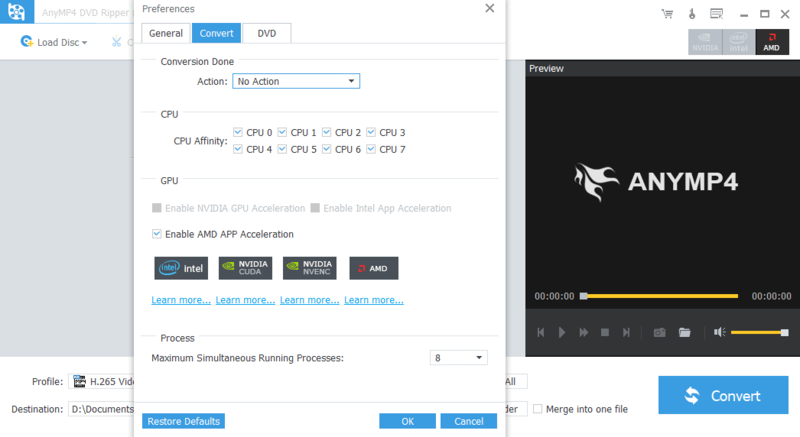 I own a desktop computer running 64 bit Windows 10 on an x64 based processor as well as an MBP running High Sierra and I have been using the free DVD ripping software Handbrake for ripping DVD to MP4 for Apple TV or AVI with no big problems. However, sometimes Handbrake would not copy a movie on Windows 10 or High Sierra/Mojave to either MP4 or AVI. Recently, I can copy movies using Handbrake on the Dell computer and play it on iTunes but when I copy the movie to a flash drive to transfer to my Mac computer through which I play all my movies via Apple TV, the movie won’t play through iTunes. Technically the procedure is I copy my movies on either the Mac or Dell using Handbrake, use MetaX or Z for artwork. Copy the movie to a flash drive, take the flash drive to my Dell and copy to an external hard drive attached to my dell. After it is copied to the hard drive, I run it on iTunes and 98% it would play no problem, until recently. 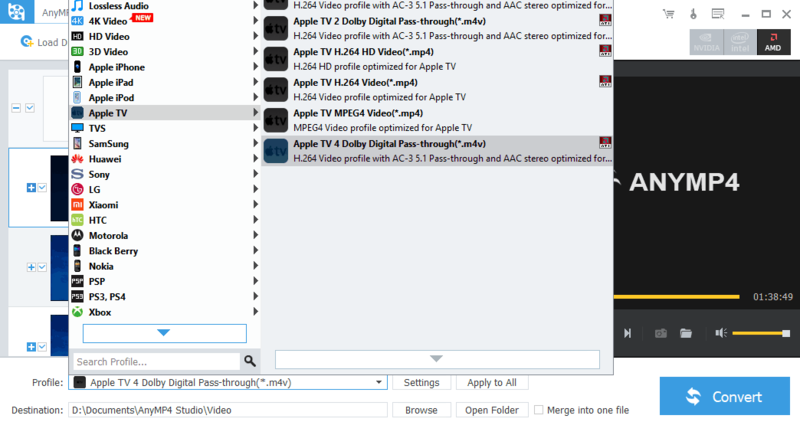 I copy my movies through Handbrake on either the MacBook Pro or Dell using Microsoft. I have approximately 3000 movies. I had very little problems until about 2 months ago. As stated I can copy through Handbrake on the Mac but the playback quality is poor, I can copy on the Dell but it won’t play on iTunes. Besides, Handbrake crashes while encoding, but I am somehow able to fix it. If you have the same problem, check this guide for help. This is where AnyMP4 DVD Ripper enters the picture. After researching and reading how wonderful AnyMP4 DVD Ripper is and how it will copy 99% of all movies I was convinced and had a copy of AnyMP4 DVD Ripper as a Handbrake alternative no matter what OS you are running, including the latest Windows 10 from Microsoft and macOS 10.13 High Sierra and 10.14 Mojave from Apple. 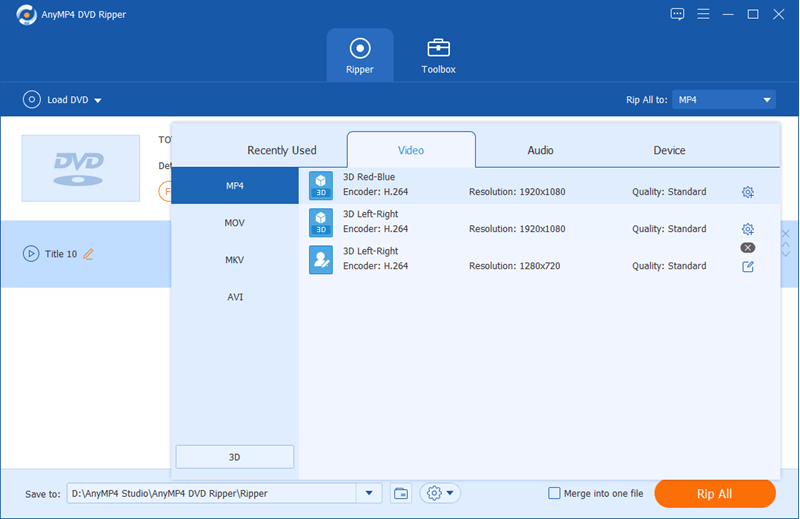 And I have been using AnyMP4 DVD Ripper for ripping my DVD collections to smart TCL and Samsung TVs as well as single MP4 files with dual audio tracks. AnyMP4 DVD Ripper has been upgraded to 64 bit, so it is fully compatible with macOS 10.13 High Sierra and 10.14 Mojave. Windows 10? No problem at all! I have several music DVDs and want to put them on my tablet as well as iPhone for CarPlay. When playing on a DVD player I can skip songs I don’t like by pressing the forward button on the remote. I have some other DVD rippers but it does not show all the chapters after a DVD is loaded, where I could just RIP and split the chapter I wanted to have. They merged all of the chapters into one when I converted it to MP4 while I need to keep the separate tracks to create a playlist. With those kinds of DVD rippers, I have to edit the one huge file, find the “chapter” or part of the track I actually want and then trim it. I don’t think this is quite correct and there must some easy way to display chapters. And AnyMP4 DVD Ripper, the top 3D DVD ripper, is just the way out with one more mouse clicks to split DVD chapters to separate MP4 AVI MKV file. 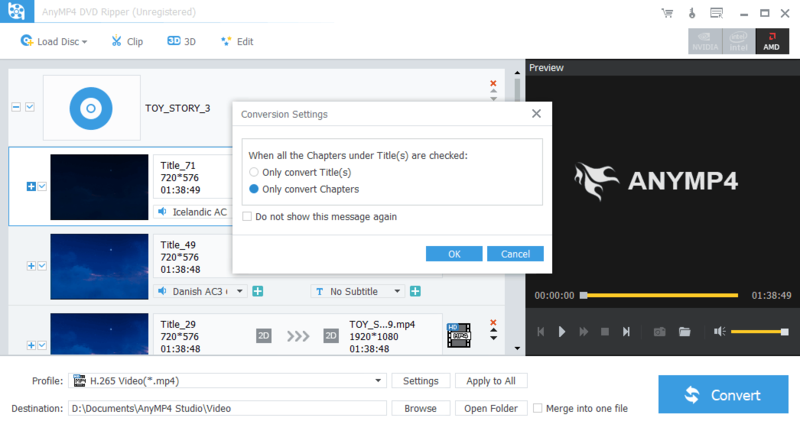 Just make sure to select “Only Convert Chapters” after you click Convert. 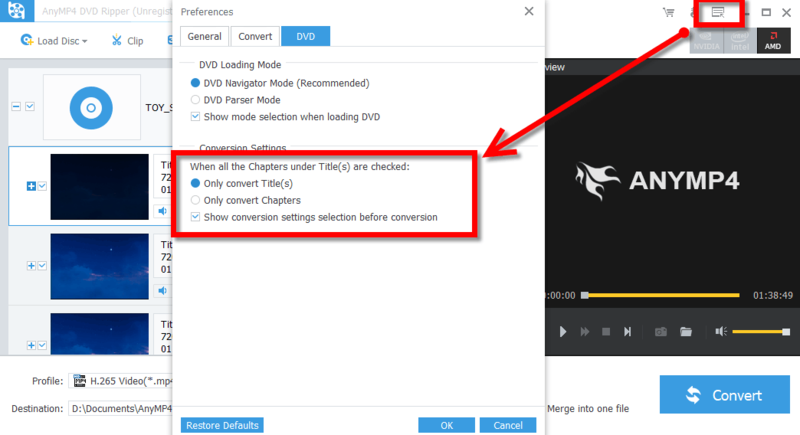 Tips, for any reason the above window does not appear, go Preference and check “Show conversion settings selection before conversion” or make “Only convert Chapters” as the default. For more details on how we split DVDs by chapters, check this guide. While I am on Windows 10, I’d like to rip DVDs to AVI which I think is the most compatible format with Windows. I’d also like to copy my DVD collection to iTunes, in order to stream to a television for playback on Apple TV. I think the quality of AnyMP4 DVD Ripper is better than what I’m currently using and I am able to keep both the AC3 and AAC audio files (passthrough) in an MP4 container to playback on my Apple TV 4 in 5.1 sound and even 7.1 sound. Also, I can keep the source video image the same so the image does not get cropped etc. (I have widescreen smart TVs and am archiving my DVDs). To be able to enjoy the Dolby sound as well as the highest quality possible, I’d always like to rip DVDs with the profile for new Apple TV 4 with Dolby Digital Pass-Through. That also increase a DVD to 1080P. However, please note that increasing the resolution does not help much in quality as a DVD is only 720×576/720×480. We know DVDs are almost 2D movies. What if we want to rip 2D movies to 3D and enjoy it? 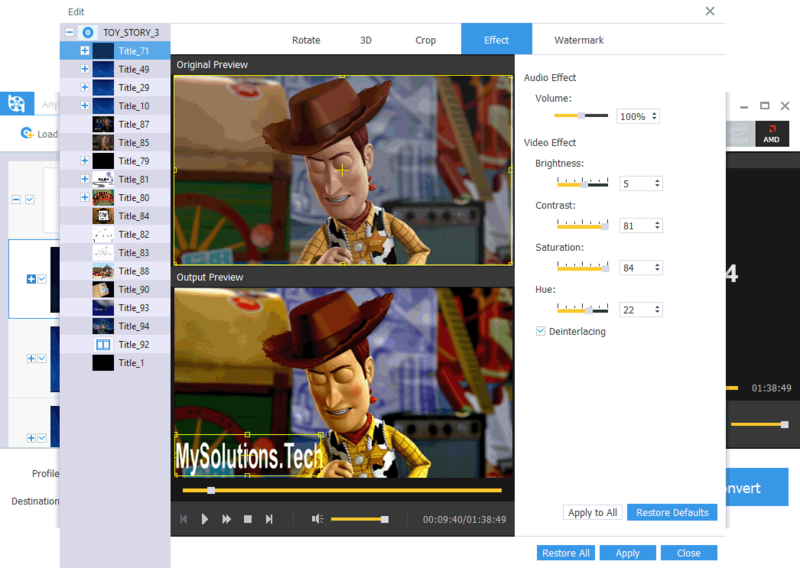 With AnyMP4 DVD Ripper, it is so easy to make an enjoyable 3D movies and there are various formats available like 3D MP4, 3D MKV, 3D AVI, 3D M2TS, 3D MKV, 3D TS and 3D WMV. Just go Output-Format-3D Format and pick up the want you want. 3D 4K MP4 and MKV are available to you to but I don’t think it is a good format to go as DVDs resolution is only 720×480 or 720×576. There are ways to improve the video quality like above mentioned in ripping DVD to new Apple TV, simply increasing the resolution doesn’t seem to be smart. 3D MP4 is recommended by me as far as I can tell. I checked some of 3D TVs and found 3D MP4 was widely accepted as MP4. You can also rip DVDs to VR devices like Gear VR, Google Gear VR Oculus etc to enjoy 3D DVD movies on your VR handset. And, there are various kinds of 3D movies, Anaglyph, Split Screen, Two separate files etc, among which Left/Right(Half size 50%)comes as default and is recommended as most 3D device supports it. Tips, to be able to watch 3D movies, you will always need a 3D screen and a pair of 3D glasses. For some other DVDs rippers, the so-called AnyDVD or Handbrake alternative, the “trim” function is very tedious to use and we see AnyDVD is not able to trim or crop. It is always 1:1 backup to a hard drive in VIDEO_TS folder or ISO format. AnyMP4 DVD Ripper does support WYSIWYG Trim and Crop and it does offer a great and easy way to do so. It starts playing as soon as you try to trim so you will see where you set the trim points. Having the window larger makes trimming easier. You can trim two more parts of the DVD and can merge the trimmed part together. The output format. It’s the same for every rip so don’t have to select it again and again. I only change it if I want but shouldn’t have to select it for each disc. Customizable Parameters. If you know DVDs and videos a lot, no problem, you are free to set almost all parameters and save as your own. Forced subtitles are NOT available.